The Foundry in Long Island City oozes with character and personality, and I recommend it to couples looking to get married locally, who love industrial-chic vibes for their event. I’ve written about it before because it’s just such a cool venue. The Foundry wedding includes 2,000 square feet of space for you to use as creatively as you’d like. The main floor is surrounded by a deep mezzanine balcony space. Overhead, exposed beams bridge the wide space. Skylights let in tons of natural light to brighten the space and keep it from feeling like a drab factory. Dark metal railings keep the modern feel without being distracting. One of my very favorite features of the building are the brick archways that edge the main space. They make perfect photo ops with a million possibilities for creating unique, non-traditional portraits. Plus, they lend an air of historical elegance to the otherwise strictly modern feel of the building. The Foundry wedding also comes with a venue manager, doorman, and security person for the day of your event. Small details like these really do make a big difference. So many of the wedding—day mishaps I see in my job could have been avoided with thoughtful event management and security precautions. A full kitchen is available for your caterers to use – again – a detail that simplifies things and makes your event go smoother. If you want to host both your ceremony and reception here, consider renting the adjacent greenhouse. With its tall brick walls and glass ceiling, it brings a feeling of lightness and can accommodate up to 125 guests. 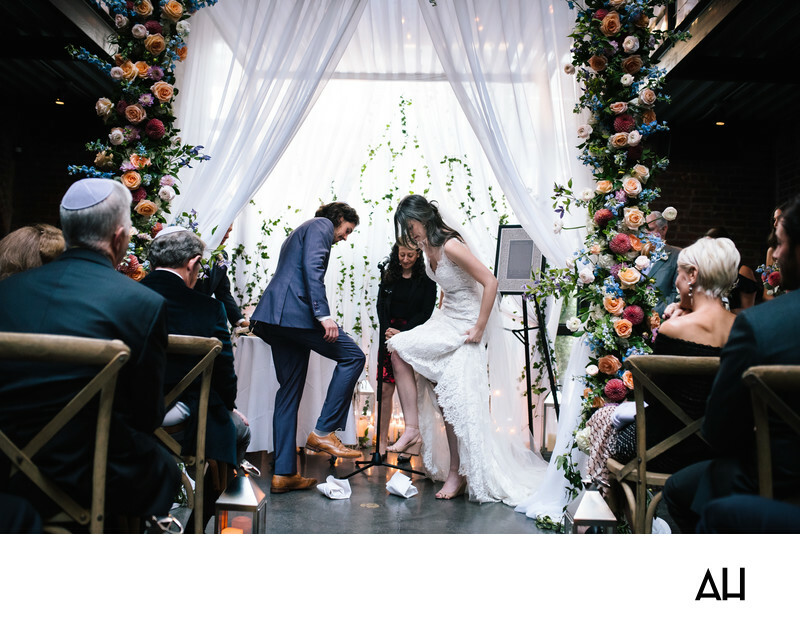 Or have your ceremony in the courtyard, which has seating for up to 100 guests and offers great views of the Queensborough bridge and surrounding sights. The third extra-space option for a The Foundry wedding, is the outdoor elevated terrace. Attached to the mezzanine level, it has great views of Manhattan and easily accommodates 80 to 90 guests. The Terrace also makes an idea space for cocktail hour.